HS2 will be the new high speed backbone of Britain’s rail network and directly connect 8 of 10 of Britain’s largest cities and their regions. Our vision is that HS2 will be a catalyst for growth across Britain creating new opportunities for jobs and skills, regenerating towns and cities, and bringing us all closer as a nation. By making it faster and easier to travel for work, business and leisure, HS2 will help deliver a stronger, more balanced economy better able to compete on the global stage. It will open up local and regional markets. It will attract investment and improve job opportunities for hundreds of thousands of people across the whole country. Once fully completed, around 345 miles of new high speed track will connect the city centres of London, Birmingham, Manchester and Leeds. HS2 trains will continue on up the East and West Coast Main Lines, serving towns and cities in the north of England and Scotland including Glasgow, Edinburgh, York, Darlington, Durham, Newcastle, Wigan, Preston and Carlisle. Overall HS2 trains will serve over 25 stations connecting around 30 million people. We expect over 100 million people a year to use HS2 trains when the network is fully completed and the infrastructure has been designed cope with growth in demand. 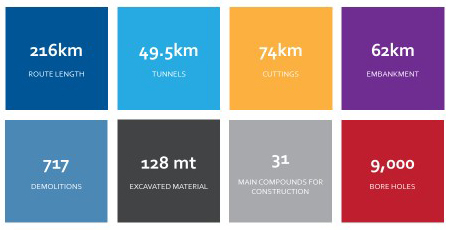 This is Europe’s largest infrastructure project. The build for the whole line will span the next 15 years and the railway itself will be in operation well into the next century. So this is a huge undertaking. 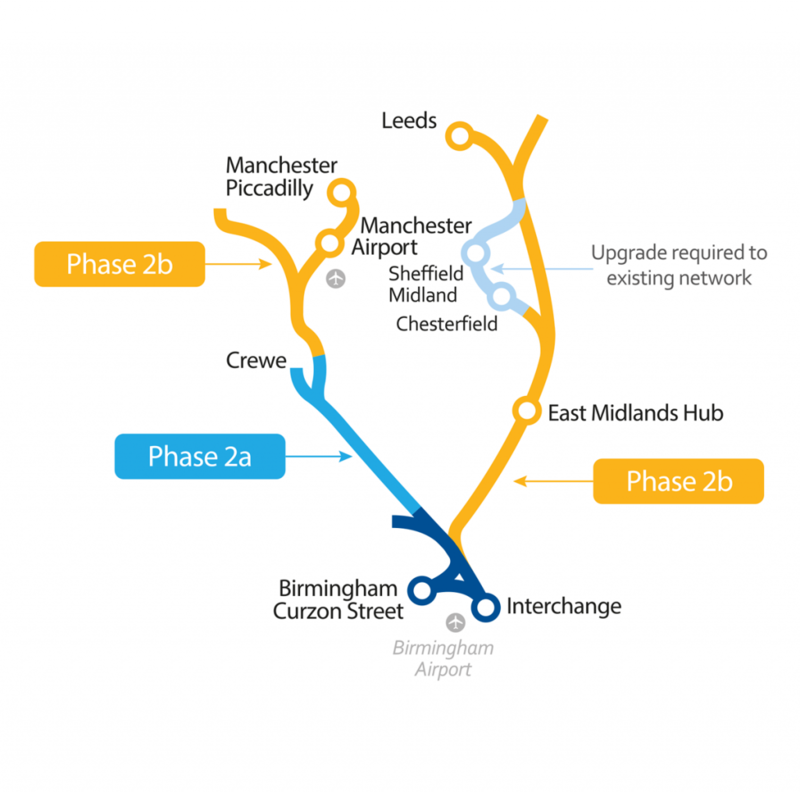 Phase One of HS2 is the new high speed line between Birmingham and London. We have been granted the powers by Parliament to build Phase One and we have awarded the the Main Works Civils contracts for construction. Area North, which extends from Long Itchington up to the West Coast Mainline tie-in near Curborough and includes the Birmingham Interchange Station and Curzon Street Station. Phase Two is split into two sub-phases, phase 2a and phase 2b. Phase 2a is the section from Birmingham to Crewe and is approximately 60km long with much of the route being in rural countryside. 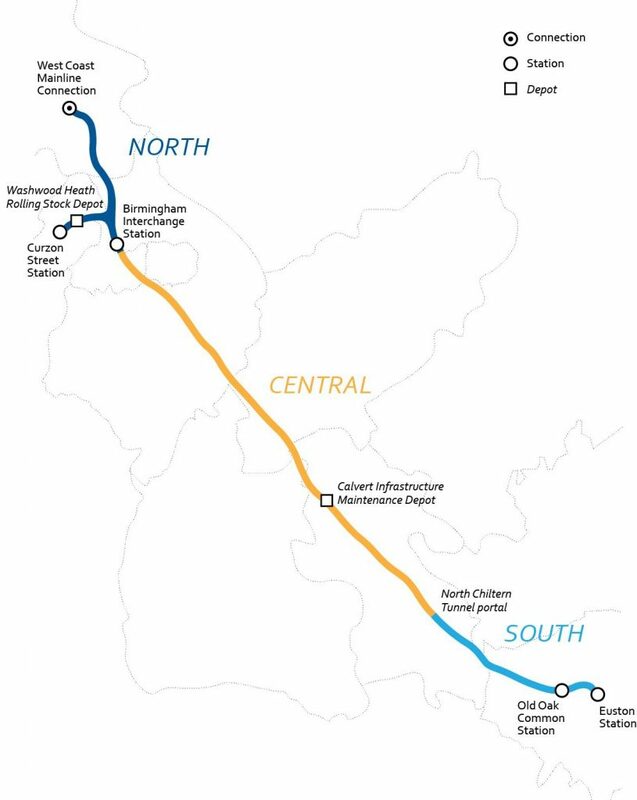 Phase 2b is then the remainder of Phase Two, connecting the railway line to Manchester and Leeds. HS2 anticipate Phase 2a Royal Assent at the end of 2019 and Phase 2b thereafter. It is envisaged that Phase 2A will be completed by 2027 and Phase 2b by 2033 when the full network will be complete. For the project as a whole buying a range of major works packages, including enabling from a relatively small number of high-value direct contracts. However, these in turn will give rise to many more indirect supply chain opportunities. The experience of other large UK infrastructure programmes such as the Olympics and Crossrail suggest we can expect that every 10 direct tier 1 major works contracts to result in over 10,000 indirect supply chain opportunities. These will be of most interest to SME suppliers, as they will be more appropriate in size and most likely appeal to their specific capabilities. 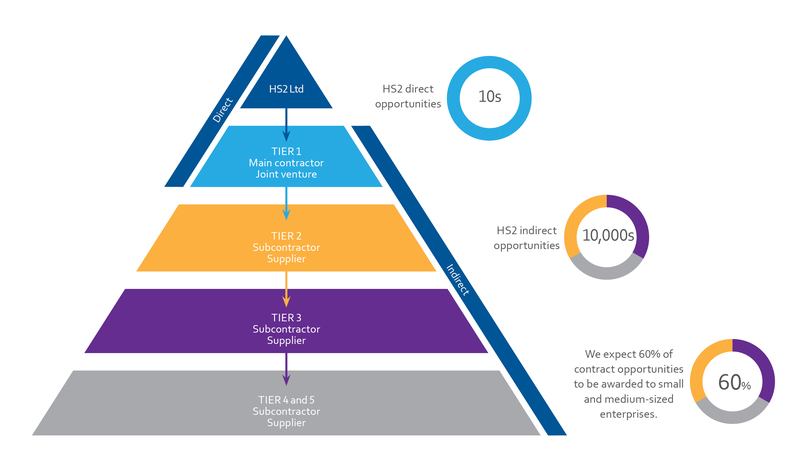 In total, HS2 expect 60% of contract opportunities to be awarded to SMEs.